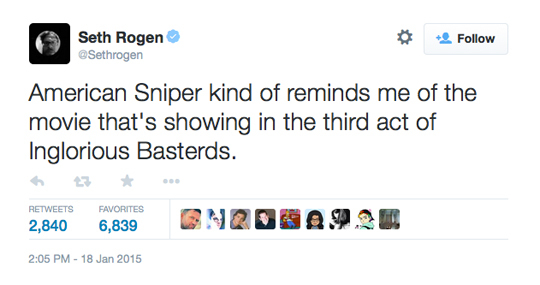 I thought exactly the same thing as Seth Rogen when I saw American Sniper. It IS a lot like the propaganda film-within-the film (about a heroic Nazi sniper) in Inglorious Basterds! And audiences are reacting the same way the audience of Nazi elite did in Tarantino’s movie, applauding with the excitement of patriotic feeling. That’s no comment on Chris Kyle one way or the other, to notice that movies often imitate other movies. Try watching Triumph of the Will with an open mind sometime. It makes you want to worship Hitler. Movies can be powerful persuasion tools. I don’t agree with Michael Moore’s comment, but I also don’t think it’s a slam on Kyle as much as a re-frame of whether ANY of the activities of war are heroic. He’s speaking from the mindset of WW2 vets (his uncle), so he’s entitled to express that. It is more true that it used to be regarded as cowardly for soldiers to lie in wait and ambush, or shoot from hidden positions. It’s basically standard procedure now. Men (mostly) in combat are required to suspend their compassion in support of missions that are often unclear. Sure, Chris Kyle was protecting his fellows, but why did he have to be there to protect them at all? It could have been a more balanced, more important movie so easily. We get to see all the reasons Chris Kyle became troubled by the stresses of combat. But we see very little of his rehab process, and just have to take it on faith that “he changed”. Without this balance, the complaints of his wife come across as whiny nagging. 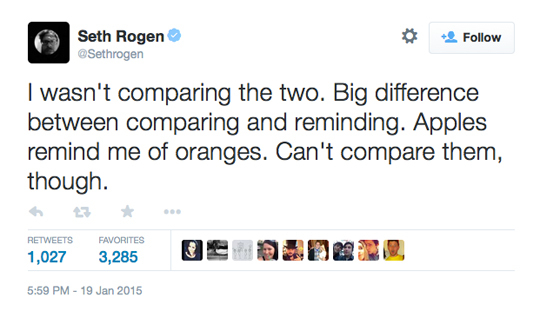 I thought exactly the same thing as Seth Rogen when I saw American Sniper. It IS a lot like the propaganda film-within-the film (about a heroic Nazi sniper) in Inglorious Basterds! […] That’s no comment on Chris Kyle one way or the other, to notice that movies often imitate other movies. He’s speaking from the mindset of WW2 vets (his uncle), so he’s entitled to express that. No, Michael Moore is not speaking from the mindset of his uncle — because Moore’s uncle probably had his life saved on numerous occasions by American snipers. Michael Moore is speaking from the mindset of a liberal who has made it crystal clear how he feels about American troops. That he hides behind his uncle’s sacrifice when he says mean and nasty things about U.S. troops further demonstrates that his “coward” digs are mere projection on his part. This kind of reminds me of when Passion of the Christ came out, there were those that disparaged it, yet many American film goers made it a success. I’ll assume his uncle was shot on foreign soil….? 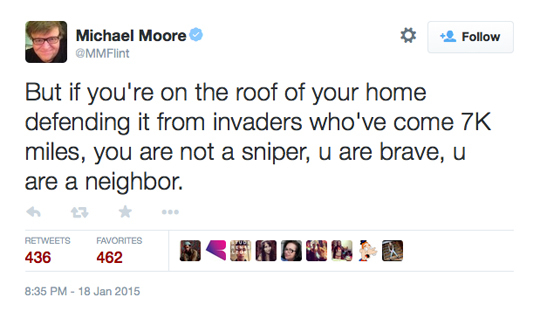 By his own logic, would not that sniper be a good neighbor? I say that tongue in cheek as it is awful many uncles, dads, brothers died in that war; but his logic is a mess. And keeping with old Gibson movie themes, I don’t think the Taliban was playing by Bravehart rules where both armies meet on a field and charged each other; if I were a soldier on patrol I’d be ecstatic if Chris Kyle were covering me. Happily for Moore, the president he backed for office is drone happy; snipers from the sky! Maybe he should worry more about that than hating on a popular movie and insinuating Kyle is a coward. Regardless, like you said, Moore’s logic is completely screwy. Are pilots “cowards”? Are sailors operating on aircraft carriers “cowards”? Are guys in tanks “cowards”? Where does it end if you want to play that game? My guess is that prior to Moore’s uncle being shot that he relied on the cover provided to him by American snipers on multiple occasions, and he did not call them “cowards.” When the enemy has a gun pointed at your head and you don’t know it, then you thank the American ally who takes that enemy out in without a moment to spare. Moore does not know what a coward is, what has he ever done that was brave. I hate the liberal spin to try to downplay people that risked and lost their lives to protect our freedom. I commented about this in your other post about the movie (I read that one first). This behavior of hating the people that protect us is just sick. I tip my hat to those who sign on the dotted line to allow the U.S. government to send them anywhere in the world — for any reason Uncle Sam wishes. 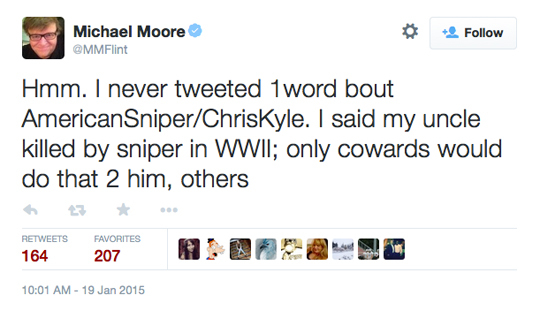 I’m not sure what Michael Moore has done that gives him the credibility to call Chris Kyle a “coward,” but I’d like to hear about it. The real tragedy is that there are Americans who listen to buffoons like Michael Moore and Seth Rogan. One of the reasons why I write blog posts like this is because I can see in my WordPress stats that a lot of people do care what Hollywood celebrities think. You’re right — it is sad that so much intellectual stock is put in men who get paid to make fart jokes for a living. Hopefully, by pushing back and saying, “Hey, this is why this guy is completely off base,” it will break down some of that unwarranted credibility that celebrities have on issues unrelated to their craft. I would think that, just like any other position in the military, it takes guts to be a sniper. You have to control your nerves and know exactly where to place the shot and when. A lot of power is in your hands. Even though we were only going through training scenarios, it really affected me to think as I was pinned down behind some tree, “Crap. If these were real bullets, then I’d be dead.” It makes you take all your training much more seriously. Here’s a good piece by the guys over at SOFREP. 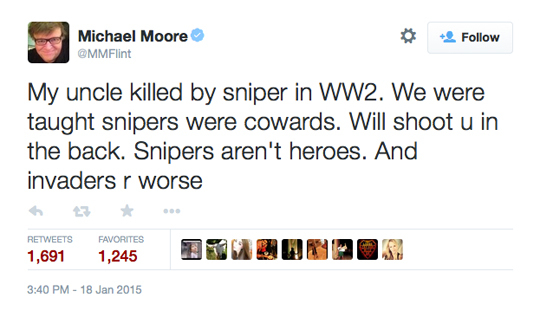 Mr. Moore illustrates a complete lack of understanding of how a sniper operates if he thinks they lack bravery. Snipers – American snipers, anyway – usually operate in two-man teams, along with a spotter, in precariously solitary surroundings, usually in hostile territory. They have nothing but their rifles and spotters to protect them, typically, and are removed to some degree from friendly forces. I would venture to guess that Mr. Moore would equate his “courage” in firing off a contrarian Tweet with a sniper’s role in combat, because men like him actually somehow believe they are brave. To think that someone who operates as a sniper lacks courage is simply uneducated, at best, and willfully ignorant, at worst. You can be a pacifist and think war is wrong, but that does not make you an expert on war, nor on those who fight it. It especially does not make you an expert on the constitution of those who step up to serve. I would guess Mr. Moore has very little understanding of that realm of the human condition. Doug… is Kyle’s story false? I’m not too concerned about some random blogger who obviously never read “American Sniper,” because on so many levels he just sounds like an ignorant fool. “American Sniper” is 400 pages long. The “story” about “Scruff Face” (Jesse Ventura’s name is never mentioned in the book) is … 1 page. And it’s vague. It says a bunch of SEALs were in a bar after a wake and a stupid 9/11 conspiracy theorist was making everyone upset with his comments. Chris said he pulled the jerk aside and told him to stop. “Scruff Face” then allegedly said the SEALs deserved to lose a few because of U.S. foreign policy, and that’s when “Scruff Face” got decked. In any drunken fight, there are always going to be two different versions of events. In this case, it’s probably two drunk veterans who were off to the side of the main party and no one will ever know exactly what happened. I do know that Jesse Ventura is a 9/11 conspiracy theorist and he does say pretty despicable things about the U.S. publicly. Why would he change while drinking in a bar with SEALs? Ventura decided it was a good idea to try and clear his reputation … by suing the widow of a Navy SEAL after her husband was murdered while helping a fellow veteran with PTSD. Good job, Jesse! You’re a real stand-up guy. That sort of says it all right there, doesn’t it? What about the claims that no one in Kyle’s unit liked him or etc? Why even respond to something like that? Even if any of that were true (Do you think everyone in your workplace likes you? I’m guessing that in your workplace failures don’t result in someone’s death, the amputation of limbs, etc. ), how does that take anything away from the fact that Chris Kyle is the deadliest sniper in American history? How would that take away from the fact that he saved countless American lives? How would that take anything away from the fact that he went out of his way to help veterans who struggle with PTSD? It wouldn’t. Just a follow up to your question: Rorke Denver, Chris Kyle’s teammate on SEAL Team 3, wrote a piece defending him in The Wall Street Journal. The bulk of Chris Kyle’s remarkable exploits took place in the Al Anbar province of Iraq in the summer of 2006. He and I were teammates at SEAL Team Three. Chris had always been a large figure in the SEAL teams. He became a legend before our eyes in Ramadi. My fellow special-operations brothers might be shocked, but I think the comments by Messrs. Rogen and Moore have had the ironic effect of honoring Chris Kyle’s memory. They inadvertently paid Chris a tribute that joins the Texas funeral procession and “American Sniper” book sales and box office in testifying to the power of his story. Being from Minnesota, I can assure you that Ventura is a moron, pure and simple. Not to mention a complete embarrassment to this state, with his 9/11 conspiracy gibberish. I think his conspiracy mindset stems from him having been hit on the head one too many times during his wrestling career. I thought it was beyond pathetic that he won his lawsuit against Chris Kyle’s widow. Emmanuel, you shouldn’t believe everything you read on the internet. Like Doug said, that random blogger knows jack s*** about Chris Kyle and obviously bought into the left’s narrative about him. It’s quite bizarre to me to see people who waited until after Chris Kyle was killed to start attacking him with this level of vitriol. Slow clap for those who take pot shots a man who can’t defend himself — because he’s dead. That’s pretty low. It is pretty low, and Ventura and Michael Moore should be ashamed of themselves. I’ve always despised Michael Moore, and already disliked Ventura because of his despicable anti-American conspiracy theories, but his decision to sue Chris Kyle’s widow really cemented my dislike of him. Doug, do you have any proof to back any of this up? Yeah I know Ventura is a huge douche, but was he right in this instance and was Chris Kyle making it all up. Doug, do you have any proof to back any of this up? Yeah I know Ventura is a huge douche, but was he right in this instance and was Chris Kyle making it all up. What do you mean, “proof”? I read the book. I told you what’s in there. Jesse Ventura isn’t named — once. Fact. Find his name in the book. You can’t, and neither can Jesse Ventura. I don’t have the time nor the energy to go trolling through the court records to see how it all went down, but from what I did read it seemed like a B.S. decision on the judge’s part. It would have been nice if Chris Kyle was alive for the trial, but he died. He couldn’t defend himself in court. So all we’re left with is that Jesse Ventura essentially sued a Navy SEAL’s widow over “Scruff Face.” Seriously, I don’t want to talk about him any more. Take it someplace else, because he disgusts me and I don’t want this thread turned into a conversation about a 9/11 conspiracy theorist. In regards to people who don’t like the movie because they were opposed to the wars, oh well. That’s their problem. I haven’t run across one review by a liberal hack who seems to have actually read more than five pages of the book (and that’s being generous) so it’s no surprise that they would try to latch onto anything they can in the movie to try and pick it apart. They’re the losers who opposed the surge, and they’re also the losers who supported President Obama’s decision to completely yank the rug out from under a fragile Iraqi government by leaving zero troops behind in Dec. 2011. I don’t think too highly of their opinions on U.S. foreign policy. Michael Moore called the groups of Sunni radicals that would morph in the Islamic State group “freedom fighters.” They have now basically run all Christians out of Iraq and they’ve created mountains of chopped off heads across the entire region.’Nuff said.